"The golden soup was a sensation in the nose, the mouth, and the brain. Spicy enough to clear the sinuses but not incendiary on the tongue, the soup was creamy with a hearty depth that she could only compare with a bolognese sauce that had simmered for hours. This laksa recipe was worth traveling thousands of miles for." The laksa is made from chicken stock, a spice paste and coconut milk. When it is ready it might be garnished with shrimp, tofu, green beans, noodles, bean sprouts and fresh mint. A mixture of textures and colors is the most important guideline to garnishes. 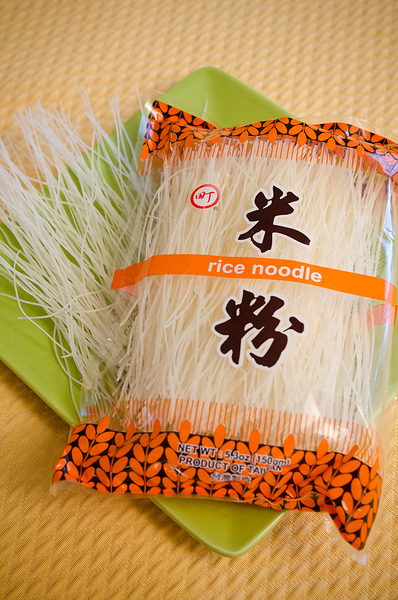 Rice noodles, shown in the lower photo, and fresh egg noodles are both used in this recipe. The service of the Laksa is easy to set up ahead of time with the garnishes of noodles, sprouts, mint leaves and shrimp in small bowls. The sauce is poured over just before serving so the garnishes are still crisp and seem fresh and the shrimp is not over cooked. Amy describes a Laksa party she wants to give because it's so visually beautiful, no hard and fast rules on the condiments so is suited to letting guests make their own bowl with whatever combinations please them. That's very helpful with vegetarians, pescaterians or gluten free guests.